WE ASK THE JUDGES: HORSEMANSHIP DO'S AND DON'TS - Mark Sheridan Quarter Horses, Inc. 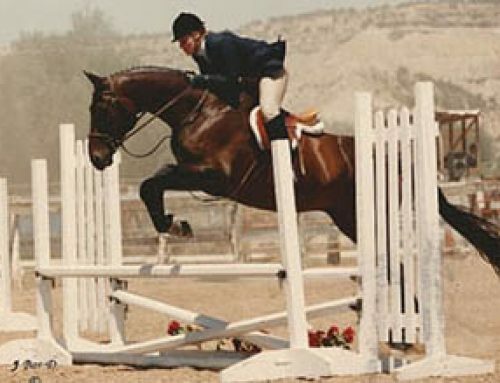 The first installment of GoHorseShow.com’s “We Ask the Judges” series covered Showmanship and was hugely popular with our readers. 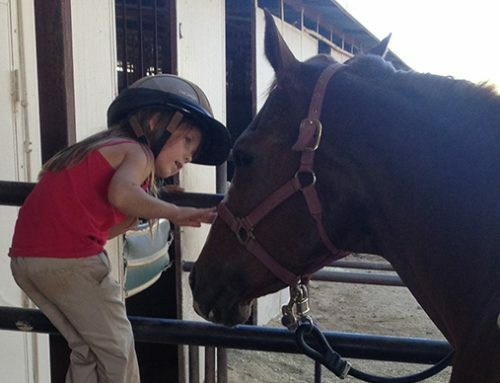 The next discipline in the series is Horsemanship. We talked to AQHA judges, Bruce Walquist and Stephanie Lynn, who will be judging the East Coast Novice Championship Show this year, as well as AQHA judges and World Champion trainers, Mark Sheridan and Robin Frid. See what interesting insight these industry leaders have regarding this challenging class. Question #1: What is your biggest pet peeve in the horsemanship’s. I judge alongside many talented and knowledgeable professional horseman and horsewomen, and feel that these are the most helpful and useful tips that will aid in future success with your horses. I also suggest contacting the AQHA to find a talented Professional Horseman in your area who can help you with whatever guidance you might need for your horse, regardless of the breed, event, or type of training. Feel free to contact me anytime for thoughts or questions regarding this article or past articles and enjoy riding, teaching, and learning with your horse! Robin Frid–Exhibitors not studying and doing the pattern correctly–they don’t follow the correct path—have uneven circles, poor lines, and cut corners. Doing the pattern correctly is such a freebee, so the exhibitor needs to make sure foremost that their pattern is correct! Mark Sheridan–Competitors need to be at the cone ready to go! Do not under any circumstances make the judge wave to you, or nod more than once for you to commence with your pattern. If there is a working order, listen for your order of go. Riders also need to have contact with their stirrups and the horse’s mouth—not all spur with no connection with their partner. Spur stopping your horse will also push your knees out and you will loose contact with the sides of your horse as well as creating unnecessary space between your leg and the barrel of the horse. You also need to make sure you execute the appropriate gaits asked in the pattern—a trope is not a gait! Bruce Walquist–I like a rider that has a true connection with the horse. I like them to be a team–not the rider to look like a statue on top of their horse. Stephanie Lynn–Riders with stiff upper bodies and toes that are down and stuck out is one of my pet peeves. Riders that use a spur stop tend to get their feet out of position and the horse also has a tendency to stop on their forehand–so that is not my favorite look. I prefer when the rider uses their hands and legs together to control their horse. I don’t like riders that have their seat and pelvis rocked forward and ride on their crotch. I like riders that sit down and around their horse. Question #2: What sets your winner apart from the rest? Stephanie Lynn–A rider that can really ride and capable of making appropriate decisions at the spur of the moment to produce the most favorable outcome. I don’t like riders who I call, “posers.” I look for someone who I would want to ride my colts at home. Mark Sheridan–Riders that perform the patterns correct and symmetrical with even communication between hands and the horse’s face. A rider that shows confidence is a must! 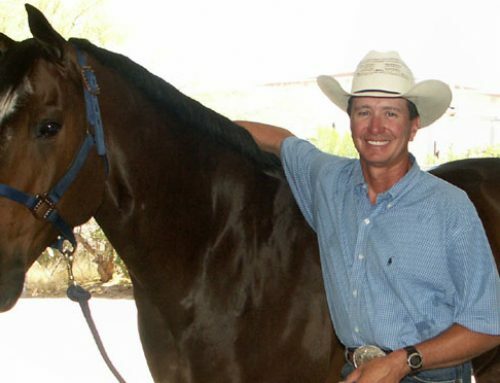 Bruce Walquist–The rider that performs the smoothest pattern and makes it look easy with correct posture and shows a special connection with their horse. Robin Frid–There is a look a winner will have the second they move up to the cone. They will have a look of determination and confidence–like they want and deserve to be there. They will immediately be selling themselves and their abilities to me. They need to be a smart aggressive rider that also knows their limitations and shows off their strengths while playing down their weaknesses. Question #3: What type of rein length do you prefer? Bruce Walquist–I don’t like excessive or too tight of a rein length but rather moderate length with the rider maintaining light contact with the horse’s mouth. Robin Frid–Soft contact with horse’s mouth–not a death grip or too loose where the reins are flopping. Stephanie Lynn–Either extreme is not attractive–a reasonable length that works best for your horse. 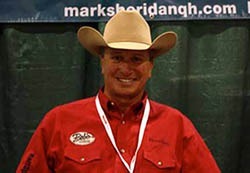 Mark Sheridan–An extremely loose set of reins will create additional lack of communication with the horse. One will also have to raise their hands way too far in able to reach the mouth of the horse when picking up on the reins. I understand that the western pleasure class has created some of this, however horsemanship is an entirely different event. 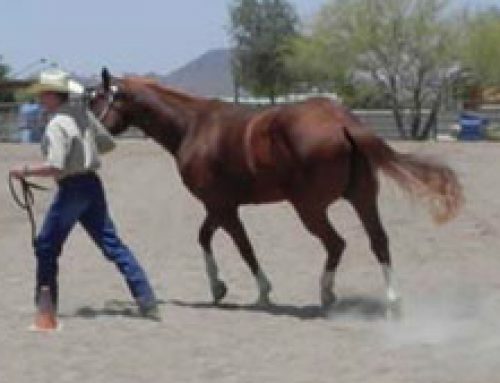 Reasonably loose reins are okay, as long as the exhibitor can remain light contact with the horse’s mouth by picking their rein hand up a few inches. Total communication between horse and rider is what I personally look for. Question #4: How important is maintaining the pivot foot in the turns? Robin Frid–The rider won’t really gain or lose points if their horse maintains their pivot foot. As long as the horse holds their hip underneath themselves and drives forward out of the turns then that will be credit earning on my card. Bruce Walquist–The better the horse keeps his pivot foot–the better I like it. I prefer correctness to horses that go too fast and flop around end to end. I don’t think the rider is showing smart horsemanship if they try to force their horse to do something they are unable to complete in a confident and correct manner. Stephanie Lynn–Swapping ends is not good but most reiners don’t hold their pivot foot, so as long as it is relatively correct with adequate speed that works for me. Question #5: What is the importance of speed in your patterns? Mark Sheridan– If the judge wants a large fast circle then a slower small circle, that is how you must ride them if you want a big score. I would say that the majority of the time, many riders trope, or lope their horses so slow in the small circles, that it is hard to tell if they are actually in a three beat lope. Then, when they go to the large fast circle, they simply go to the regular nice lope. This will be cause for a very dramatic reduction of their score. I would suggest that people practice going fast at home and teaching your horse speed control. Start slow, increase to galloping a few large fast circles, and then back to the small slow circles. Remember that the Horsemanship class is the stepping stone to Reining. Bruce Walquist–Do the pattern as fast as you can as pretty as you can. You must be able to maintain control while increasing speed. Stephanie Lynn–There needs to be a visible change in pace if asked. I like to write patterns that have the rider stopping out of a forward gait, and a pattern that gives a better rider on a less talented horse a better chance of doing well. Better riders are able to pull off these type of maneuvers. Robin Frid–Riders that are able to be aggressive, strong, and fast and show a definite change of speed are in the upper levels of difficulty. If they can pull it off than more power to them–but remember the definition of this class involves control and communication with the horse and rider–so the rider can be aggressive but must also be smart at the same time. Question #6: Where do you like the non-rein arm to be in the horsemanship? 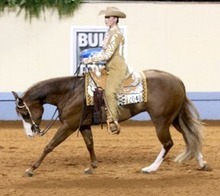 Stephanie Lynn–I like the non-rein arm to be even with rein arm but not too close to the saddle or to the other hand. Bruce Walquist–I don’t like it higher or lower than the rein hand or too close to the rein hand or pointing out toward the horse’s ears. Robin Frid–I like the rein hand to be even with the rein hand and pretty close to it but in a natural position. In men, I like their arms to be held wider due to them having broader shoulders. Mark Sheridan–Not stiff and even with the rein hand with a relaxed bent elbow. Question #7: What type of horsemanship outfit do you prefer? Stephanie Lynn–Anything that is distracting is not appropriate. Hair in a bun is still the cleanest look. I prefer the more cowboy look with just a neat and clean well-fitted shirt. If you just can buy one thing–buy one well made shirt that you can wear in the class. You have different judges everyday so they won’t know if you wore the same thing yesterday. I don’t think the extra bling is appropriate or necessary. Confident riders can easily pull off a plain shirt. Bruce Walquist–Nice well shaped hat with very neat and clean attire. You need to look like a winner but glitz and glamour is not necessary. I could care less if someone has an expensive outfit on in a class. It doesn’t change my opinion of them. It is their riding skills that matter. Robin Frid–I like someone in a well-fitted outfit and nice well-shaped hat. The outfit needs to be appropriate for the rider’s body type. Also, some riders can’t pull off the regular shirts, so whatever they wear needs to be flattering and help them portray confidence when they walk into the arena. Mark Sheridan–The very first thing I notice is your hat. If your hat looks like it has been in a rain storm or you slept with it on, my first impression is going to be very low. You do not need to have a thousand dollar hat, but you do need to have it shaped correctly by a knowledgeable person that can clean and block your hat. No ponytails for girls–anything that moves will distract and make the rider look loose. As far as outfits go, any clean looking and well-fitting equitation blouse will work just fine. Make sure that your colors match and your chaps and blouse are the same color, black blouse, black chaps, etc… It is important to create the nice straight line from top to bottom. Don’t break up that line. Question #8: If you could give one piece of advice to someone showing in horsemanship, what would it be? Mark Sheridan–Be at the cone and ready to go…..be confident and set the bar to where everyone has to beat you. If there is not a working order, volunteer to go first. Confidence is an attractive horsemanship quality. Jump up there and set the standard for the others to beat. If things start to go wrong, keep riding and finish strong. Never quit riding and showing. Complete your pattern and move to the rail with your head up. It is not necessary to nod to the judge or hesitate for approval after finishing your pattern. Keep your head up and smile, and show confidence! Bruce Walquist–Make it look easy. It is all about how you and your horse perform the maneuvers as a team. Stephanie Lynn–Present your horse to that horse’s capability at your level of riding and ride everyday without stirrups! Robin Frid–Show until the very end. Never give it up and act like you made a mistake. In a tight situation, your reaction to a bobble or situation may effect your placing in a positive or negative manner.